When can I introduce Chicken or Turkey to my baby? As mentioned above, most pediatricians in the United States recommend that chicken and turkey, and other meats and proteins be introduced to a baby when he is between 8-10 months of age. This recommendation is changing however. In many European countries and the UK and Canada, national health services and many pediatricians recommend meats as one of baby’s first foods due to the level of heme iron in meats. The premise is that offering your baby’s meats earlier rather than later helps him maintain proper levels of iron and ensures adequate levels of zinc and protein too. Chicken is high in protein and iron. It is one of the most easily digested of the meats you will feed to your baby. Chicken is most often recommended to be baby’s first meat. Turkey, like Chicken, is high in protein and iron. Turkey also makes a great first meat for baby. Chicken and Turkey are amazing sources of protein. If you’re looking for lots of Iron, use the dark meat. lower in fat. The darker meat of chicken and turkey, such as thighs and legs, is higher in iron and higher in fat. It might be a good idea to offer your baby the darker meat of either turkey or chicken. The fat content makes this meat easy to puree into a relatively smooth texture; the higher iron makes this portion of the turkey and chicken an excellent choice. A yummy way to make chicken and turkey is to boil pieces in a scant amount of water with added veggies and a dash of spice such as basil or garlic powder. I always recommend cooking any food by baking it. Baking helps retain the most nutrients with steaming being another method to retain nutrients. Using a crock pot to cook and stew meats is another great way to cook turkey or chicken. Keep in mind that nutrients will leach into the liquid that you add to the crock pot so try to make use of the liquid by adding it back into baby’s food whenever possible. If your baby is not used to the taste of chicken or turkey, using the juice/liquid from the crock pot may make the flavor too strong. Strain the liquid if need be and use water to make a turkey or chicken puree instead. 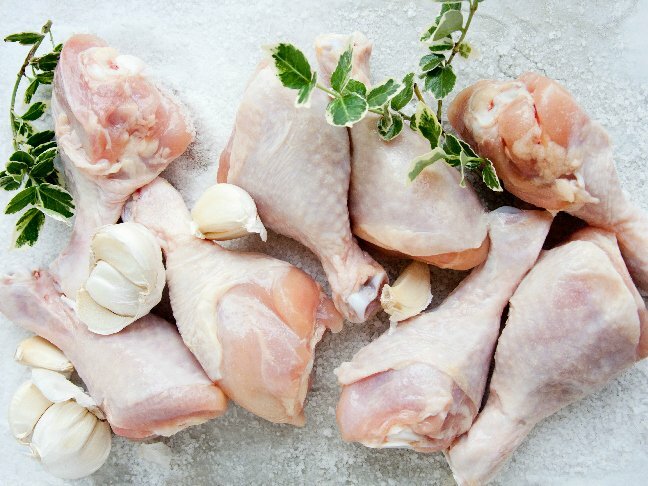 Step 1: To poach chicken, it is easiest to first cut the chicken into dices – use boneless chicken. Step 2: Add water or broth to a sauce pan – enough to cover the meat. Step 3: Bring the contents of the saucepan to a boil and then turn heat down to simmer. Step 4: Simmer for approximately 15-20 minutes. Meat will turn white and juices will run clear. Step 1: To bake chicken, preheat the oven to 375 degrees F.
Step 3: Add chicken to baking sheet, lightly season if desired and if your baby has had spices – no salt! Sometimes I rub the chicken with a bit of olive oil and then season it – mostly if I am cooking skinless breasts. Step 4: Place baking sheet in the oven and bake until the juices run clear – baking times will vary depending on the size of the chicken portions you are cooking. A general rule is that you should cook meat for 20 minutes per pound. Chicken breasts may bake in 25 minutes while legs or thighs may take a shorter time. Chicken Pieces – You may braise the chicken prior to adding it to the crockpot if you wish. This is not really necessary and if you are pressed for time, you may just skip it. Step 1: Add chicken to the crockpot and cover in liquid – broth, water or a combination of the two. Using a bit of apple juice is nice as well. Step 2: Turn crockpot to low and simmer for 4-6 hours. Whole Chicken – Wash the chicken with cool water then transfer the chicken to your crockpot. If you like, stuff the chicken with a halved lemon or orange. Step 1: Set crockpot on low and simmer for 8 hour or longer. Be sure to check the chicken and look for the juices to run clear. Step 1: Place turkey or chicken chunks in blender or food processor and puree until a powdery mix is formed. Slowly add water and puree further until a smooth consistency is created. Step 2: Add as much liquid as needed to make a consistency appropriate for your baby. You may add veggies or fruits to this puree as you like. Step 1: Puree chicken/turkey with cooked apple in a food processor or blender until desired consistency for baby is achieved. Step 2: Bring to a slow boil and then turn the heat down. Step 3: Simmer until the meat pieces are cooked; approximately 20 minutes. Keep an eye on the liquid level when simmering. Step 4: When meat is fully cooked and the apples are mushy, remove contents to a bowl and allow to cool. Puree, mash or chop for your baby. Step 1: Mix all ingredients together, transfer to blender/food processor and puree or chop to make textured for older babies. Cook chicken/turkey pieces and peach together in a pot with a scant amount of water – simmer until chicken/turkey pieces are cooked; approximately 20 minutes. Keep an eye on the water level when using small amounts of water and simmering. Add the rice to the cooked turkey/chicken and peach and then process as needed for your baby’s texture preference. Substitute the peach for mango, papaya or apricots or combine them all. Step 2: Boil or steam the potato and carrots until tender. You may also bake the carrots & sweet potato together for a more yummy taste. Step 3: Mash the sweet potato and carrots and then add the cheese; mash some more. Step 4: Add the chicken or turkey and then chop, mash or puree as needed for your baby. Step 1: Mix all ingredients together and serve – serve as is for those accustomed to lumps & textures or chop down or puree if needed. Add some carrots or sweet potato cubes for more color and fun. Baby Food Cubes May Be Safely Kept in the Freezer for 3 Months. It is preferable, but not an absolute must, to use the cubes within 1 month however. Meats are more unstable when frozen so it is best to use Meat Purées as soon as possible. Meats are now being recommended as a first food (but not THE first food) due to the bio-available levels of heme iron, zinc and protein.